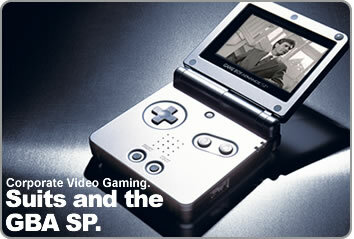 David goes off on a bit of a rant about the corporate world of suits, and also somehow ties it all into a review of the wonderful Game Boy Advance SP. Singing midgets & piano punk-pop. Casinos, monkeys and brushes with death. "I met my girlfriend on the Internet." Star Wars, Buffy and Transformers. The UKs Best Kept Rock Secret. There is now a new eyemachine forum. It's a lot bigger, nicer looking and you can add avatars and profiles to give yourself a bit more personality. You can also send each other private messages and put up more contact details. You can even copy and paste thread specific links to your friends. It's only just gone up so is looking rather empty at the moment. So please get posting. All of the 'Forums' buttons in the main menu now link to the new forums, but some of the text links, such as those at the end of reviews and features, and especially those at the end of news stories at present link to the old forum. These shall be changed to link to the new forum over the next couple of days. Quite a while back - I can't recall when, have a look through the news archive if you're interested - I posted up some news about Sunny Day Real Estate reforming under the name The Fire Theft. Well they have a sort of official site now. Its not much, but they are posting rough mp3s up every now and then and are worth checking out. Click here for the page. After years of waiting the classic Who Framed Roger Rabbit? is getting a Special Edition DVD release. This two disc set featuring commentariy from Bob Zemeckis (amongst others), documentaries and deleted scenes is released in the US on March 25th. To celebrate the release of Ape Escape 2, the official website is offering a cool downloadable Desktop Ape for PC users. Just go to www.apeescape2.com from March 10th and download your free ape who will deliver news, hints, tips and fun facts to users over the coming month! After the (apparant) success of the Aliens Vs. Predator Deluxe Model last year, MacFarlane Toys have decided to release a new range of Aliens and Predator toys, featuring different variations on your favourite movie xenomorphs from each of their different films, such as the Predator, Predator Hunter, 'Dog' Alien and Warrior Alien; The Deluxe Figure in the series coming in the form of the Queen from Aliens, complete with gooed up victim and chestburster. Click here for images at the Movie Maniacs 6 microsite.